I grew up listening to Howie Rose hosting Mets Extra before and after New York Mets games on WFAN, and I’ve enjoyed listening to him call games on television and radio in the years since. I had been looking forward to reading Put It In the Book! : A Half-Century of Mets Mania since it came out at the beginning of last baseball season, but I’d held off buying a copy in hopes of meeting Rose and getting an autographed version at a book signing. That didn’t quite work out, but I got my autographed book anyway when a friend gave it to me for Christmas. While I enjoyed Put It In the Book!, I have to admit that it didn’t quite live up to my expectations. If you’ve listened to Howie Rose enough to want to read this book, you’ve probably heard most of his stories before. There is a certain charm to reading about how Rose used to practice his play-by-play skills by calling games into a tape recorder from his seat in the upper deck. And it would have been odd not to include Rose’s memories of the 1969 and 1973 playoffs. But many of us could finish those stories for him at this point. On the other hand, I enjoyed reading about the influence Marv Albert had on getting Rose’s career started. And there were other stories that I hadn’t heard before, about players from Pete Rose to Rickey Henderson and Todd Pratt and those in between. There is relatively little focus on the current and recent teams – David Wright gets a few pages, Terry Collins gets a few paragraphs, Johan Santana‘s no-hitter and Game #161 performance in 2008 are talked about and Jose Reyes is quickly mentioned, but that’s about it. Certainly understandable, since Rose still has to work with the current team, but unfortunate. If you’re a long-time Mets fan, I’m not sure that I’d recommend Put It In the Book! to you. But if you’re interested in what it’s like to be a sports broadcaster, Put It In the Book! would be a good addition to your library. Put It In the Book! is available in hardcover at a list price of $24.95, for iBooks for $13.99 and for Kindle for $9.99. 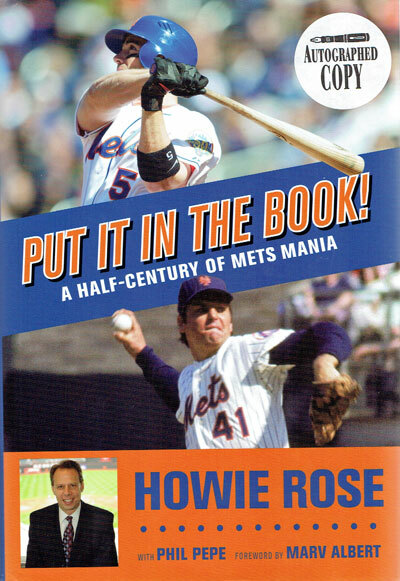 Tagged: book review, Howie Rose, Mets, New York Mets, Put It In the Book! I feel sorry for you that you missed the days of Lindsay Nelson, Ralph Kiner, and Bob Murphy. Now THOSE were great announcers. I beg to differ about Howie Rose. He simply talks too much and too loud. I just find him annoying. I always found this quality about him annoying on both his show on WFAN and later on when he became a Mets play-by-play announcer. I find him un-listenable. But everyone has their own opinions on things. And I listened to Howie Rose back when he first started on radio in New York, on Larry Kenney’s show from 5:30 to 10 AM on 1050 WHN, a country station. Larry Kenney was one of the funniest radio disc jockeys anywhere! Rose did the sports reports every hour. He had taken the place of Bill Mazer on the Larry Kenney show; those were big shoes to fill! He was certainly capable back then, and I called him up during the Larry Kenney Show (off the air) and he was a really nice and friendly guy. (Ironically, WHN went off the air in the late 80s, and WFAN took over.) He was okay, and I called him up on the phone during the Larry Kenney Show. Now, he just strikes me as coming across as a bit egotistical. I might be wrong that he is, but that’s just how he seems to be to me. I think his ego got the best of him. By the way, he started on Larry Kenney’s show on WHN in about 1976, so I had heard him going back to that time. A long time ago. I did get to hear Bob Murphy on the radio for a number of years, but he was partnered with Gary Cohen for most of them. Not a bad combo, either. One of my favorite baseball-related items is an autographed 8×10 photo of Bob Murphy.